Heat oven to 375°F. Unroll both cans of dough; separate into 16 triangles. Cut each triangle lengthwise into 3 narrow triangles. Cut small slit in each sausage. Insert 1/4 teaspoon blue cheese into each slit. Place 1 sausage, cheese side down, on shortest side of each triangle. Roll up, rolling to opposite point. Place stuffed side up on 2 ungreased cookie sheets. Bake 12 to 15 minutes or until golden brown, switching position of cookie sheets halfway through baking. Immediately remove from cookie sheets. Meanwhile, in small bowl, mix sauce and dressing. 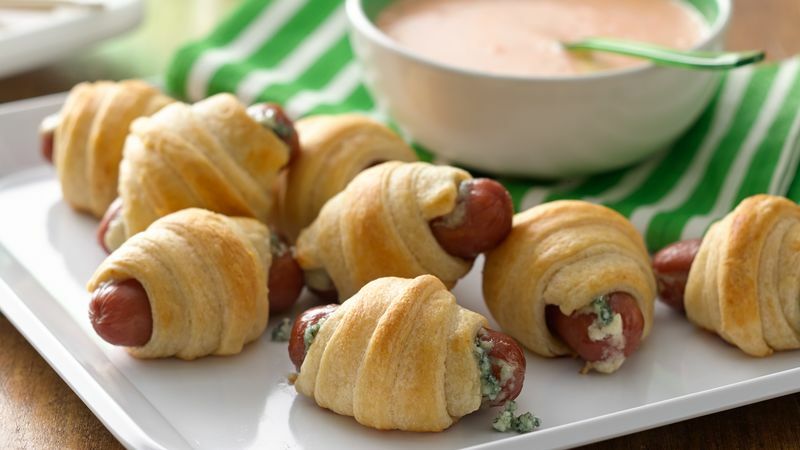 Serve with mini crescent dogs. Try different sauces with these dogs for fun--barbecue sauce, steak sauce and honey mustard all make nice substitutions. To keep the Buffalo theme, add celery and carrot sticks to your serving tray.